Rustic dinnerware is somewhat casual rather than elegant but it can really add style to a dinner with friends and family. It is great for ranch houses, cabin dinnerware or homes that feature country or western décor. At my parents ranch we use pottery serving dishes for everyday use. Pottery dinnerware would be a wonderful addition but we haven't got any yet. My mother has western dinnerware that has brands around the rims of the plates. It matches the décor of her entire house. Her kitchen is decorated with barn wood featuring a sign that says "Cowboy Café" over a barn wood shelf that holds chuck wagon style tin ware including a coffee pot, cups and a platter adorned with long horn cattle. She's a lot like me, she loves dishes, but she's more inclined to a rustic style. She also has some horse dinnerware. 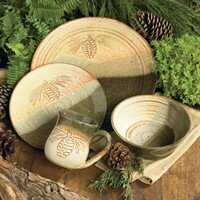 Moose dinnerware, bear, elk or deer designs, and fish dinnerware also fit into the rustic décor. 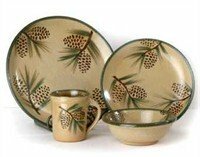 Pinecone Dinnerware also fit the bill. One of my sets of china that I inherited from my Grandmother is adorned with pinecones. My uncle purchased the set as a gift for his mother. This set is precious to me because it brings back memories from my childhood. It is more elegant than casual dinnerware but fits the style of my family. My other grandparents were more into fishing. They spent a lot of time at the lake after Grandpa retired. I remember having a fish fry at their home after a successful fishing trip. The fried, filleted yellow cat was served on a crystal plate that was shaped as a fish. Sometimes we had trout, white bass and so forth. We usually used paper plates for such gatherings, but I'm thinking that Grandma would have loved to have a set of Spode dinnerware featuring a Spode Woodland Bass Dinner Plate or a rainbow trout . 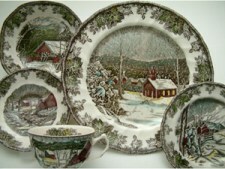 Rustic dinnerware is often used to match décor or just to go along with the interests of the people that are serving. There are many choices of dinnerware sets that will be fabulous for get-togethers.